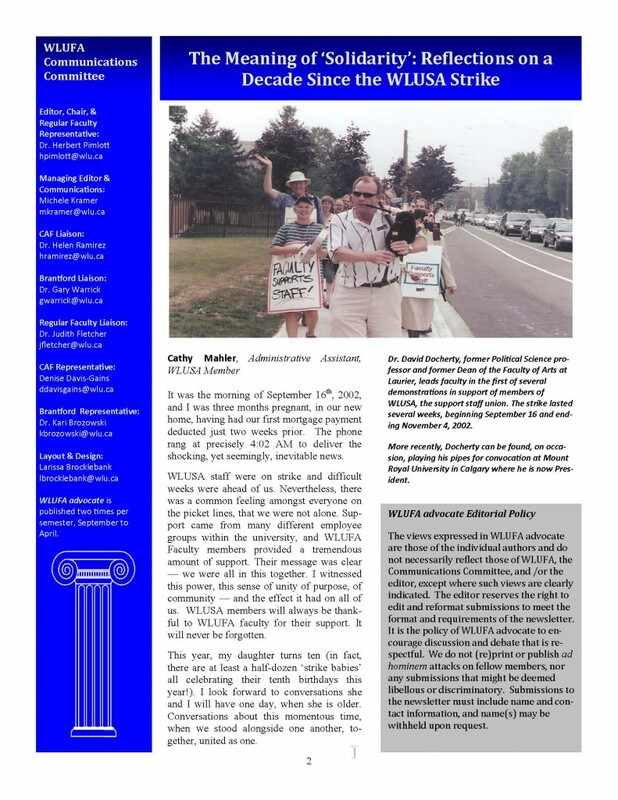 As we head into the ‘home stretch’ of the semester, the fourth and final issue of WLUFA advocate is out (see below). 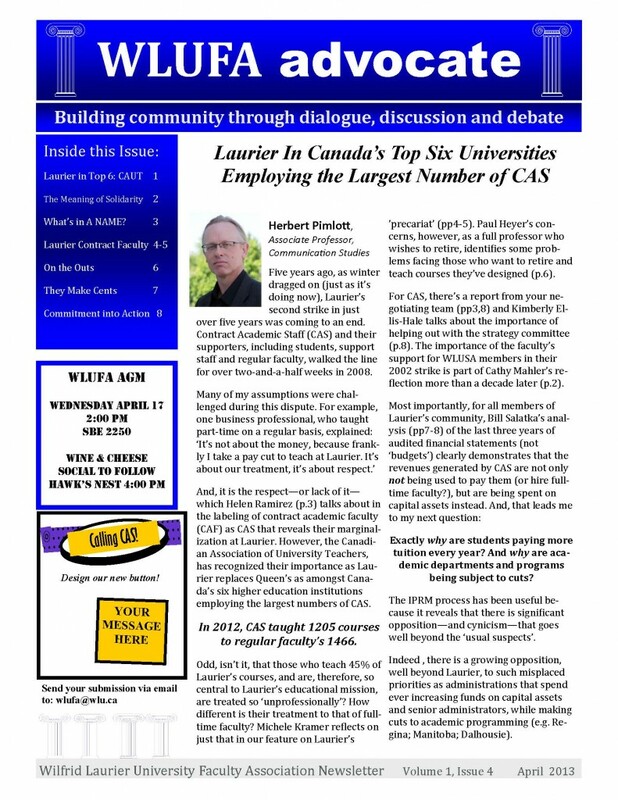 According to the CAUT’s national committee on Contract Academic Staff (CAS), Laurier is now in the top six universities “having the largest number of Contract Academic Staff” – we now employ more than Queen’s does. We also have a seat on that committee!! 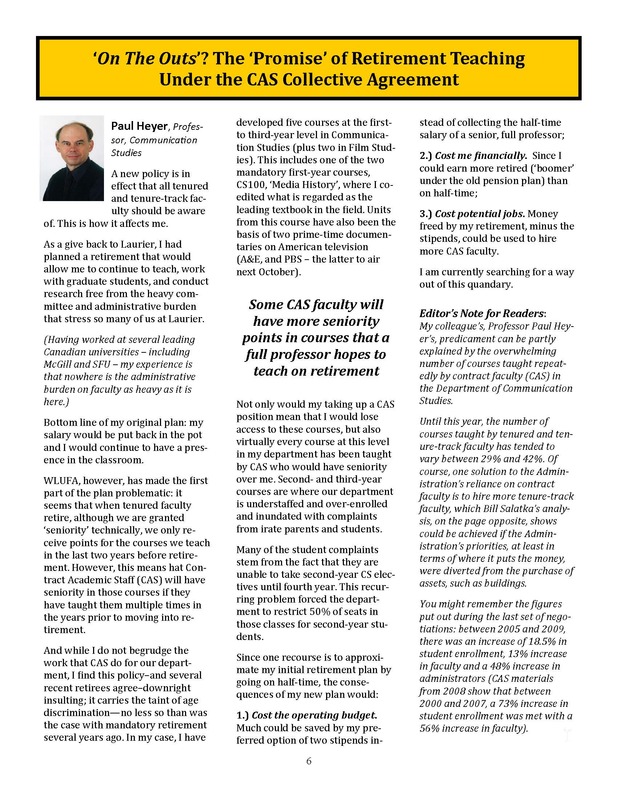 For such a ‘notable’ distinction nationally, it is not surprising to learn that CAS faculty teach 45% of courses (2012). 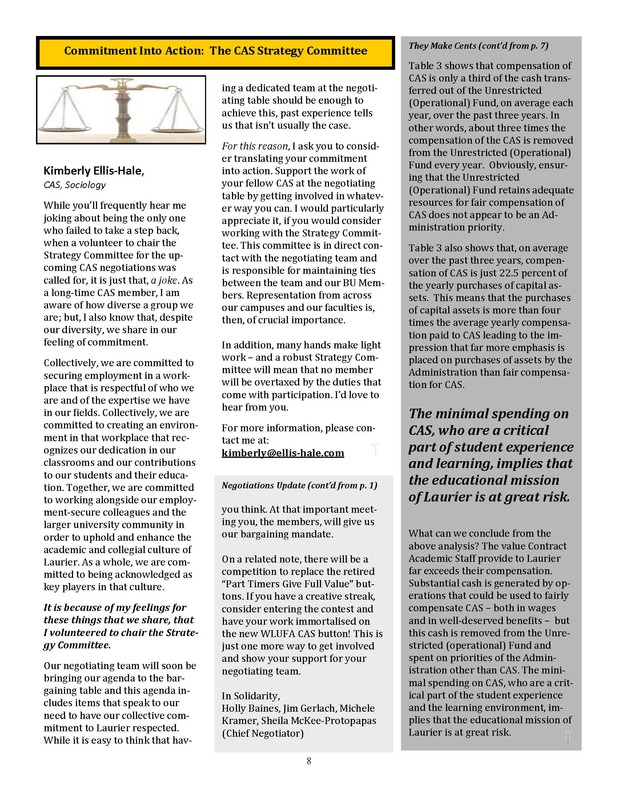 Of course, depending upon the proportion of contract faculty in your department or programme, it’s clear that CAS faculty play such an integral part in delivering ‘excellence’ and ‘innovation’ in education at Laurier. Michele Kramer, Paul Heyer and Bill Salatka raise issues that concern ‘full-time or regular faculty as well. Michele raises points of similarity in last-year’s full-time negotiations, whereas Paul sees some difficulties with the CAS Collective Agreement in wanting to retire. 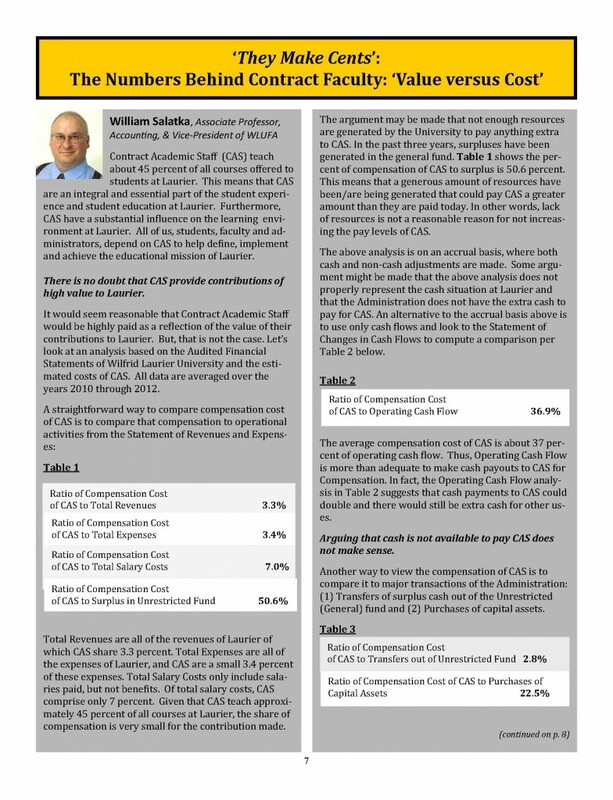 CAS faculty only “cost” 3.3% (yes, you read that correctly) of total revenues in the last fiscal year. For more about the finances, read Bill Salatka’s analysis of the last three years of the University’s financial statements, which raises questions about the Administration’s spending priorities. There is much more. When you’re finished reading your copy, please consider passing it onto others in the Laurier community. We are still in the process of building and extending our communications capacities to WLUFA members as well as the broader Laurier community and the general public. I would like to give thanks to every single member of the Communications Committee, who have devoted numerous hours and countless e-mail exchanges (the burden of modern communications!!) to helping prepare, edit, proof, write, and distribute WLUFA advocate, and I would also like to thank our contributors as well. Finally, I would also like to thank the WLUFA Executive and President for having the willingness to support the CC’s endeavours, and the WLUFA staff for their help and support. 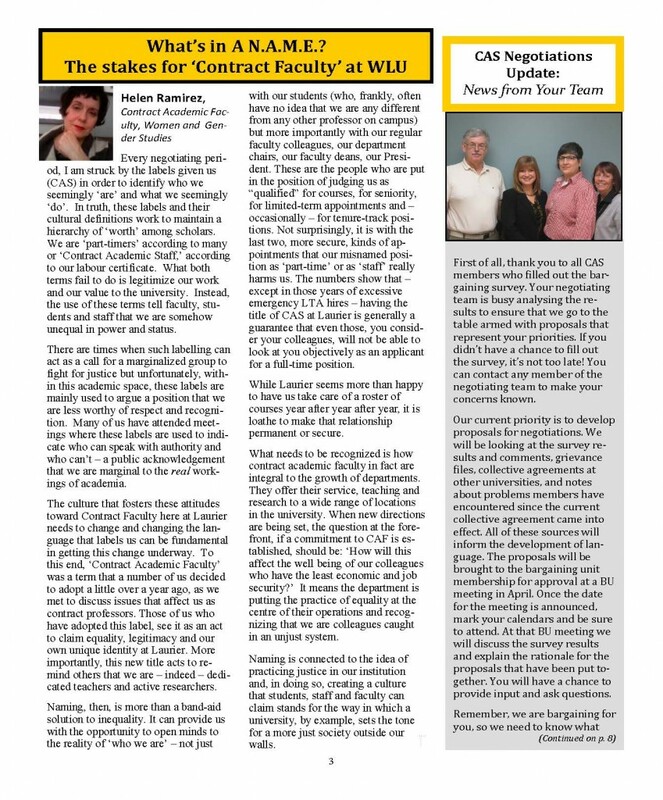 Both, Michele Kramer and Larissa Brocklebank, deserve special mention for their contributions for enabling us to get WLUFA advocate out.